Many families have stories claiming their ancestors were American Revolutionary War heroes or even signers of the Declaration of Independence. Unfortunately when working with these families on tracing their family lore... many of the stories do not survive genealogical scrutiny. Only 15 of the 56 Declaration of Independence signers have male descendants today. Locate your ancestors born between 1710 and 1765. Establish through paper evidence how you are related. Find proof of their military service in the American Revolutionary War. You can find these records online at Ancestry.com, Familysearch.org, and Fold3.com. If you’ve identified your ancestor born between 1710 and 1765 who was living here around 1775-1776 continue on to Step #2. If you’ve identified an ancestor born between 1710 and 1765 who was living here 1775-1776, the Daughters of the American Revolution (DAR) website and Sons of the American Revolution (SAR) website are great places to start looking for your ancestral patriot. Both SAR and DAR membership applications show in detail the lineage of members back to the patriot that served. The applications provide valuable lineage clues including names of family members, birth and death dates, marriages, the patriot’s regiment and rank, burial place, and sometimes biographical information. If you find your ancestor listed as a patriot, that means another descendent has been approved for membership. You can piggy back on their approved application when you apply for membership, perhaps providing additional information you located in step #1. Didn't find your ancestor in DAR or SAR? That doesn't mean your ancestor didn't serve this country's fight for independence. These databases only contain patriots whose ancestors have applied for membership. Maybe you are the first to make this discovery. These records can be found on Ancestry.com, Familysearch.org, and Fold3.com. These records often provide name, date of birth, date of enlistment, rank, physical description, date and place of discharge or death. The pension records contain information on wives, children, and place of residence. If you’ve found your Founding Father, congratulations! If you want to celebrate your revolutionary roots, move onto step #3. 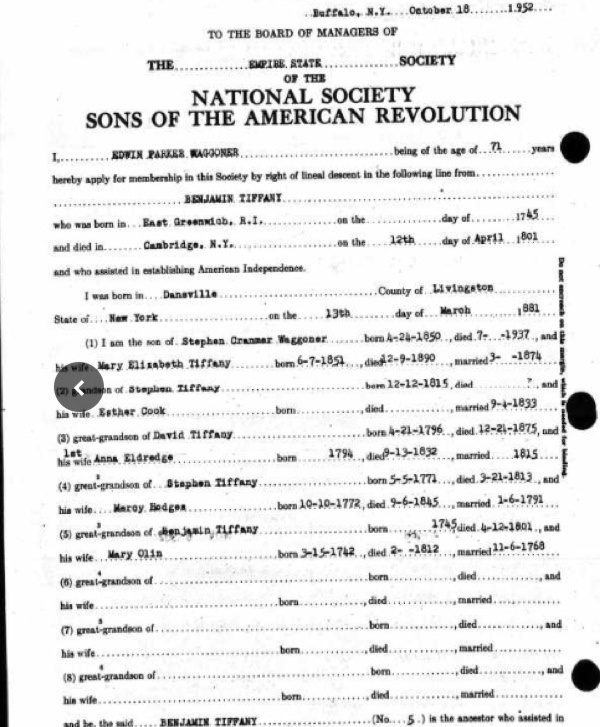 Once you've identified your patriot ancestor, you may wish to join a patriot lineage society such as Daughters of the American Revolution (DAR), Sons of the American Revolution or Descendants of the Signers of the Declaration of Independence. It's a wonderful way to honor your ancestors and preserve your family's revolutionary roots forever. What is a lineage society why might you want to join? Ready my blog post "4 Reasons to Join Lineage Societies"
To join, you will need to provide documentation that definitively connects each generation from you back to your revolutionary ancestor. So when doing your research in step #1 and #2, make sure to keep careful records. Documentation required will include birth certificates for yourself, parents, father, mother, grandparents, etc going back 3-4 generations in your family. You will also need as many death certificates as you can obtain. Census records and military records will be required. Family bibles, family histories, cemetery records, and obituaries can also be used as evidence. Every lineage society has different application process. Visit their websites and carefully review each application process. Many will connect you with a member who will help guide you through the application process. Some people find the research and application process rewarding. If you don't or your short on time, you might consider hiring a professional genealogist. If you have think you have ancestor in your lineage who may qualify you to join a lineage society, I can help you find out and prepare your application. Contact me today for a free consultation. Hooray for National DNA Day - Celebrating 15 Years this April 25th!